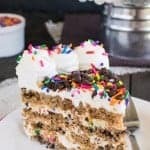 Four layers of creamy goodness makes these Chocolate Cookies and Cream Cheesecake Bars a pretty and delicious dessert that everyone will love. Well, I finally got to experience fall weather here in Florida. Yesterday it dropped to a chilly 65 degrees. It was definitely time to bust out the jeans and sweatshirts from the storage boxes! The cooler weather was a very welcome change from the hot humidity. I grew up in Pennsylvania, so I love fall weather the most. There is just something about a slight chill in the air, changing leaves, the smell of a bonfire, and getting to wear layers that makes me smile. I’m happy that we got to have two out of four on that list yesterday. Today is bright and sunny, but that chilly weather is still here. Yay for flannel pants and sweatshirts for another day. When it gets cooler, I find myself heading to the kitchen more often to bake cookies or brownies. 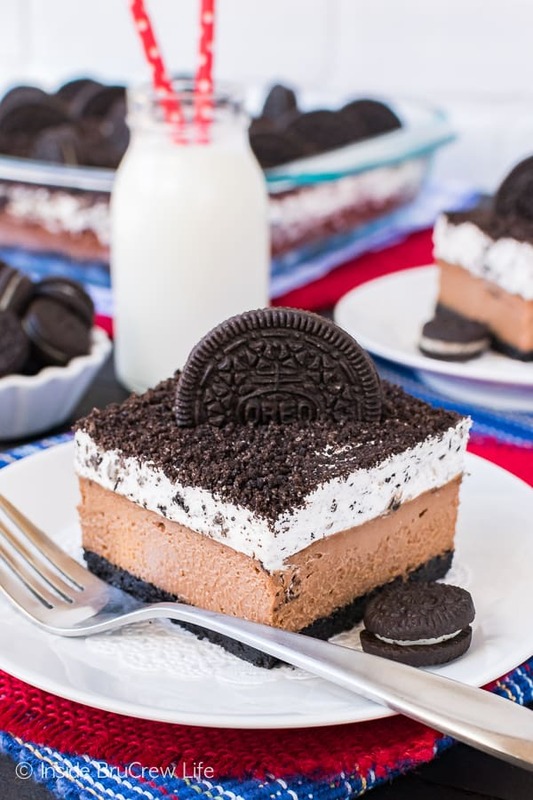 Lately though I have been finding myself wanting to bake all things cheesecake. 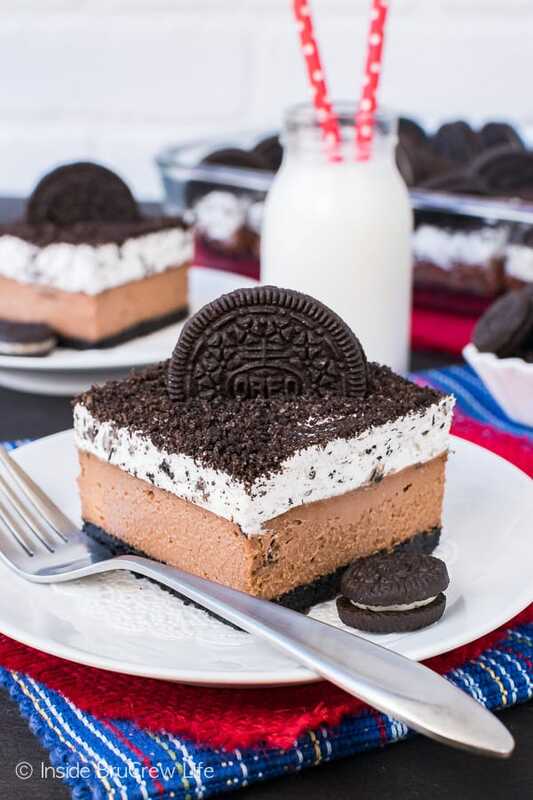 I think it’s because my cookbook Cheesecake Love finally came out after 2 years of work, and now I can share about it. I have quite a few lists of different cheesecake ideas that didn’t make it into the book. 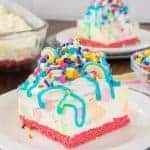 Get ready to be blasted with all things cheesecake because I can’t wait any longer to share those fun ideas from my lists. 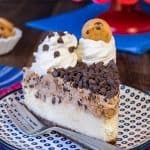 Last week I shared this chocolate chip cookie mousse cheesecake and have plans to make a pumpkin cheesecake pie and some fun cheesecake fudge later this week. Cheesecaking all the things is my motto right now! 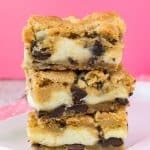 These cheesecake bars were made with our daughter in mind. She adores all things cookies and cream. Any time I ask her what cookies I should make for school lunches, she requests these chocolate chip cookies and cream cookies. They are definitely her favorite treat. 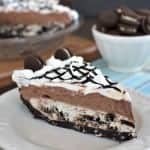 I decided to create an easy chocolate cheesecake with those some flavors included in them. It’s a good thing that I had somewhere to send these bars because I seriously thought about hiding in a closet with the pan. Seriously. They are that good! 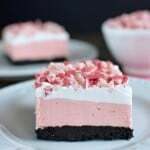 Four different layers make these chocolate cookies and cream cheesecake bars a pretty dessert to share at any dinner party. Here are a few tips to keep in mind as you head to your kitchen today. Mix together cookie crumbs and butter and press them into a foil lined 9×13 dish. 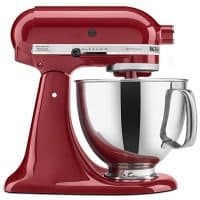 This just makes it easier to lift the bars out later to cut nice even slices. Bake the crust 10 minutes, then let it cool. Make sure you set your cream cheese out ahead of time. It is easier to beat sugar into soft cream cheese. Add the vanilla and sour cream and beat the mixture again until it’s creamy. Pour in a good quality melted chocolate bar. Be careful melting it in the microwave. It’s always a sad day when you try to heat it quickly and scorch the chocolate. Add your eggs and beat the mixture one more time. This time be careful not to over mix the batter. Too much mixing can add air bubbles that could make your cheesecake crack as it bakes. Once the cheesecake has finished baking, pull it out and let it cool on the counter for at least an hour. Then place it in the fridge to chill completely. 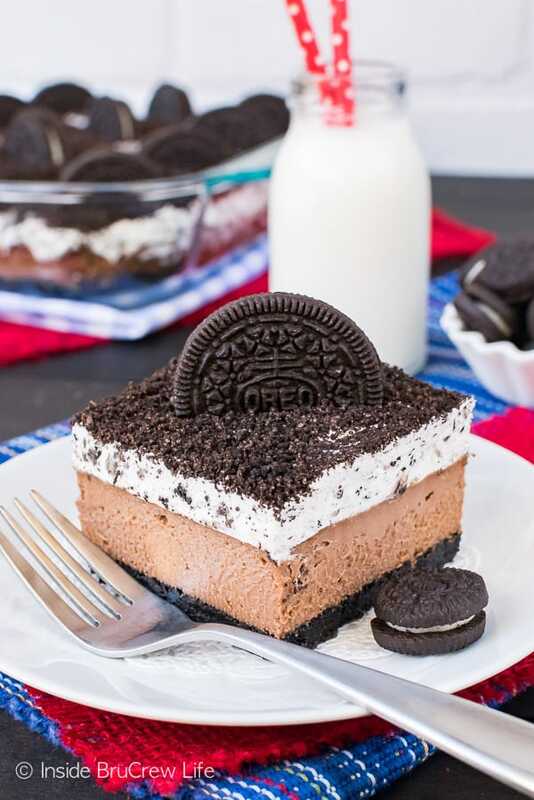 Stir together a container of Cool Whip and coarsely chopped cookies and spread it on top of the cheesecake bars. Sprinkle more crushed cookies on top and serve with cookie halves. Find someone to share the cheesecake with, or you will find yourself eating half the pan in no time at all. Preheat the oven to 350 degrees. 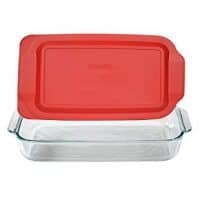 Line a 9x13 pan with foil and spray with nonstick spray. 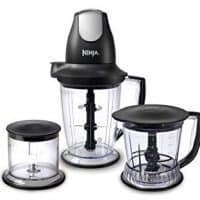 Place the cookies with filling in a food processor and pulse until they are crumbs. Mix in the butter and stir until coated. Press the mixture evenly in the bottom of the prepared pan. Bake for 10 minutes. Remove the pan from the oven. Place a large baking sheet on the very bottom rack of your oven and fill it halfway with water. Beat the cream cheese and sugar until creamy. Add the vanilla and sour cream and beat again. Pour in the melted chocolate and beat until mixed in. Slowly add the eggs and beat until mixed in. Be careful not to over mix. Pour the cheesecake mixture on the cooled cookie crust. Place the pan of cheesecake on the oven rack right above the pan of water and bake for 45 minutes. Remove the cheesecake and let it cool for 1 hour on the counter, then place it in the refrigerator until completely chilled. Coarsely chop 10 cookies and stir the chunks into the container of Cool Whip. Spread the mixture evenly on top of the cooled cheesecake. Crush 5 cookies into fine crumbs and sprinkle on top. Cut the remaining cookies in half and place on the bars. *This post contains affiliate links. Inside BruCrew Life may receive a very small percentage from sales made through these links. As always, these do not cost you any extra. Thank you for letting us share products with you this way. Congratulations on your book! 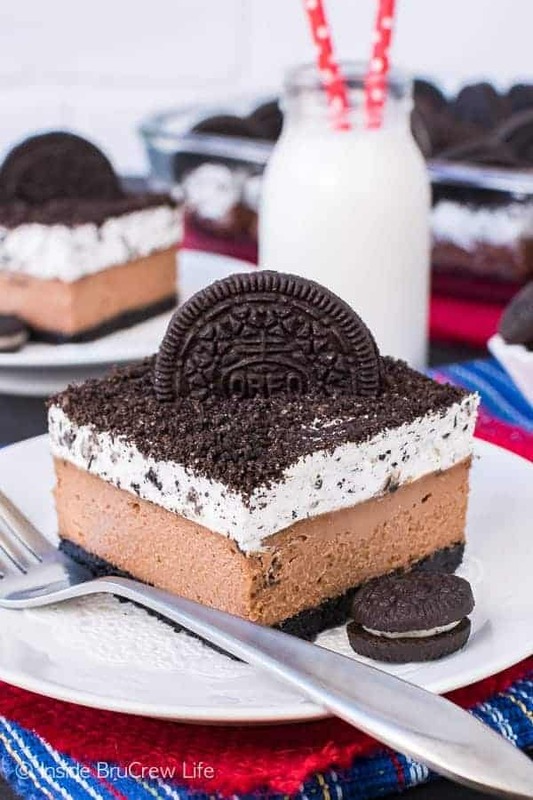 This cheesecake would be popular at my place too. Everyone loves anything cookies and cream! Enjoy your fall weather as here summer has come very quickly. Sweet mystery of love, at last I have found thee! These bars look incredible! Congratulations again on the book -you are incredible!